Drone Camera : DJI announced a new version of its phantom 4 drone, the phantom 4 advanced,which offers many of the features of last year's phantom 4 pro in a less expensive price. The upgraded versions has a camera, 20-megapixel sensor that can shoot 4K video at 60 fps, a variety of automatic flight modes (including Draw, ActiveTrack, TapFly, Gesture, and Tripod settings), and improved internal storage and battery life (up to 128GB via microSD and 30 minutes, respectively). The Phantom 4 Advanced is also available in a Plus variant, that includes a controller with a 5.5-inch 1080p screen built in like the pro. The Phantom 4 Advanced's camera has a wide-angle lens specially designed for aerial photography, with an aperture range of F2.8 to F11 and a 24 mm equivalent focal length. It’s also equipped with a mechanical shutter and auto focus support. The mechanical shutter eliminates rolling shutter distortion, which can occur when capturing images of fast moving subjects with an electric shutter.The obstacle sensing range of the Phantom 4 Advanced front vision sensor has been increased to 30 m. You can do a quick vision system calibration via the DJI GO 4 app, or do an advanced calibration by launching the DJI Assistant 2 in your computer. 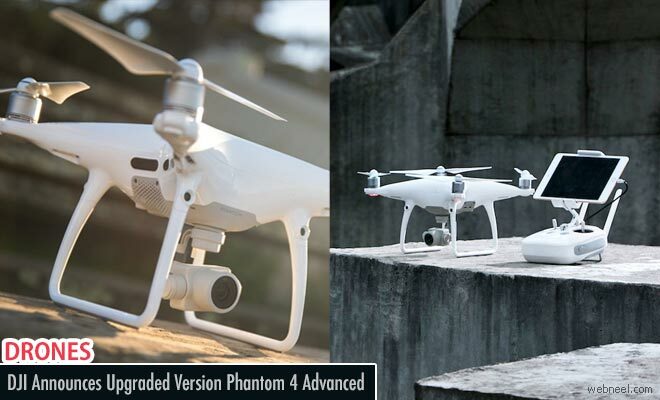 The Phantom 4 Advanced is meant to directly replace the original Phantom 4, which DJI will stop selling when the Advanced releases on April 30th. The Phantom 4 Advanced is priced at $1,349, while the Phantom 4 Advanced Plus (which includes the integrated screen controller) will cost $1,649.